The Complete Ceremony filmed with one HD camera. ---A wireless microphone or recorder will be attached to the groom to clearly record the vows. $599 SPECIAL PRICE (Normally $895). The Complete Ceremony filmed with a min. of two cameras. ---A 60-second reenactment of ring exchange will be filmed for cool close-up views on the hands. Reception until 9 pm (Including Dinner speeches, dances, scenes of people, etc.). 3 DVDs with chapter menus.. The video begins with highlights edited to music. The rest of the video is the unedited footage. Pre-Ceremony activities, such as Getting Ready, Photo Sessions. Post-Ceremony activities, such as Receiving Line and Photo Sessions. Reception until 9 pm Dinner speeches, dances, scenes of people, etc. 3 DVDs with chapter menus. The video begins with highlights edited to music. The rest of the video is the unedited footage. * Filming for Additional Time: $100/hour. * Filming at Ceremony Rehearsal: minimum $100. *Filming Speeches at the Rehearsal Dinner: Min. $100. *Photomontage (Slide Show): $1.25/photo, min. $75. *HD Video on USB Storage Device: $25/feature, $100 for complete wedding video. *Unedited Ceremony Video from All Camaras: $60. *Additional Video Discs (DVD or Blu-ray): sliding fee with quantity. Ceremony, Formals, Reception until 9 pm. Bonus: 60-photo video montage (slideshow). Getting Ready, Ceremony, Formals, Reception until 9 pm. 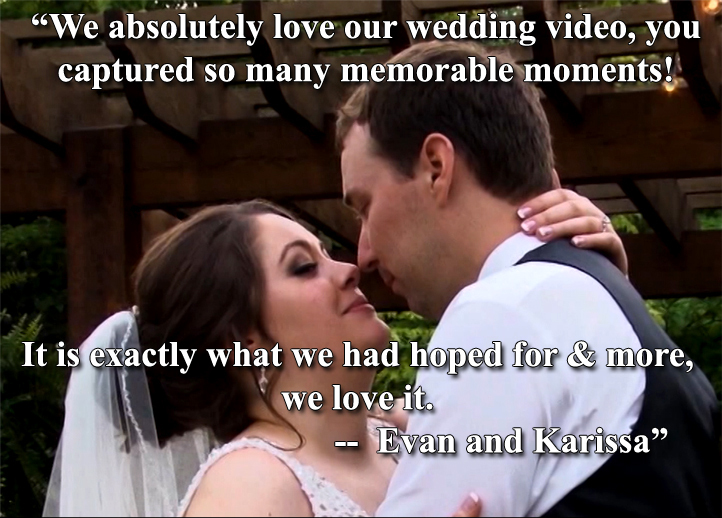 Bonus: 60-photo video montage (slideshow)..
*Early Bird: Booked at least 7 months in advance. Let us help keep your special day alive for years.